Learn more about the participants of our 2019 Cooperative Leadership Intensive! Sheryll Durrant is an urban farmer, educator and food justice advocate and a 2015 graduate of Farm School NYC. She is currently the Garden Manager at Kelly Street Garden, and Farm Coordinator for New Roots Community Farm managed by International Rescue Committee (IRC)—both in the Bronx. Prior to that, she served for 7 years as director of the urban farm and garden program for Sustainable Flatbush in Brooklyn. Her work has included developing community-based urban agricultural projects, and providing expertise and technical assistance for supportive housing garden programs. She is a former crew leader for the Urban Farm Training Program at the Youth Farm at the High School for Public Service in Brooklyn. She has given workshops and spoken on issues related to urban agriculture and food justice — for Northeast Sustainable Working Group (NESAWG), Just Food, American Community Gardening Association [ACGA], National Resource Defense Council (NRDC), Northeast Organic Farming Association (NOFA), National Public Radio (NPR) among others. Sheryll is a certified master composter through the NYC Compost Project, a 2013 We Are All Brooklyn (WAAB) Fellow, and in 2012 she received a Certificate of Achievement in Community Organizing from Citizens Committee For NYC Neighborhood Leadership Institute. She is a founding member of the Peas and Justice Collaborative, a collective of urban agriculture and grassroots leaders that tackle food justice and racial equity issues together. A former Design Trust fellow for the Farming Concrete project, she is now responsible for communications and outreach for this data collection platform that helps urban farmers and gardeners measure the impact of their work. Nadroj Holmes’ work is admittedly demographic specific. Projects showcase both the Black Body and various facets of Black Identity in tandem to inspire pursuit of salutary goals en masse. Cultural artifacts such as folklore, historical icons, popular music and trendy video are paired with research which serves as the foundation for any project. Works critically analyze detrimental anti-Black narratives and nomenclature, often while providing the Black Body a stage from which personal and interpersonal counter-narratives of resistance can be developed. Projects are often designed with the intention of challenging the audience to develop their critiquing capabilities. This is especially the case when it comes to violence, transgenerational trauma and identity. Works are always made to encourage insurrection of thoughts rooted in hegemonic narratives, especially when those thoughts normalize oppression. Athena Bernkopf is a cross-pollinator flexing at the intersections of healing justice, land sovereignty, and black and queer liberation. Brooklyn born and bred, their work as facilitator and organizer has taken them across the city including roles such as a cop watch and community safety trainer with Harlem Cop Watch; a tenant rights and anti-displacement advocate at the Legal Aid Society; a member of The Audre Lorde Project’s 3rd Space Wellness Collective; and a project coordinator at the East Harlem-El Barrio Community Land Trust. While dreaming up cityscapes abundant in ancient trees as tall and as common as skyscrapers, they are driven by a vision of co-creating liberated futures with and for oppressed peoples. Amanda Trainor is a worker-owner of Co-op Cafe and is excited to create sustainable, quality jobs for service industry workers in New York. She currently works in workforce development and is a textile artist under her business Radical Manitas. Amanda has experience organizing with union campaigns and grassroots organizations such as the Retail Action Project and Equality for Flatbush. She strongly believes that there is no such thing as unskilled labor and she values building with her communities to create collective power and heal together. Ali Toxtli is a public anthropologist focused on gender, race, culture, and entrepreneurial development. Toxtli’s experience spans over 10 years of providing critical analysis for collaborations with community ranging from ethnomusicology to public health in Latin America and the United States. Currently he manages the Bushwick farmers markets for Riseboro Community Partnership and proudly serves as Board President of the Bushwick Food Cooperative. 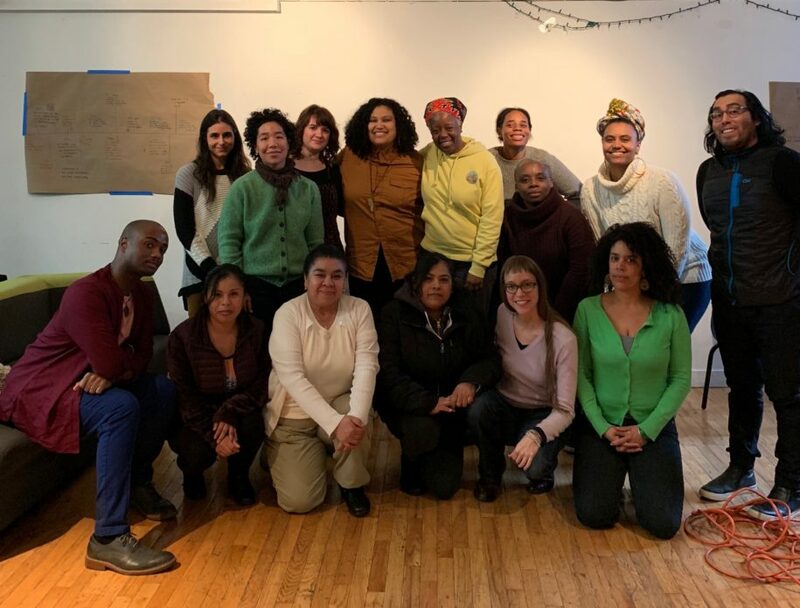 Ali aims to continue co-creating working possibilities for minority, low income, and migrant communities in the New York area and their home sending communities. Allison Maria Rodriguez is a first-generation Cuban-American interdisciplinary artist working predominately in video installation and new media. She creates immersive experiential spaces that challenge conventional ways of knowing and understanding the world. Her work focuses extensively on climate change, species extinction and the interconnectivity of existence. Through video, performance, digital animation, photography, drawing, collage and installation, Rodriguez merges and blends mediums to create new pictorial spaces for aesthetic, emotional and conceptual exploration. Renee Keitt feeds people, saves seeds and grows food. In 2018 she graduated from Farm School NYC and apprenticed at Kelly Street Garden. She is a member of 3 community gardens, and a member of NYCCGC (The NYC Community Garden Coalition). Ysanet Batista is a queer Black-Dominican woman, born in Harlem, NY and raised in between the Dominican Republic and Hialeah, FL. Ysanet graduated from Johnson & Wales University in Providence, RI and spent a couple of years working in major hotel companies before transitioning to community based work. She is the creator and chef of Woke Foods, a worker cooperative focused on offering Dominican and other Afro-Caribbean plant based foods through catering, cooking classes, and workshops. When she is not working on developing Woke Foods, Ysanet is helping other people start their own worker-cooperative businesses at Green Worker Cooperatives. She is currently a student at Farm School NYC earning a certificate in Urban Agriculture and is working towards acquiring land and starting a farm cooperative in her homeland of the Dominican Republic soon. April Greene is a full-time freelance writer, bicycle enthusiast, and longtime vegetarian. Since 2004, she has been helping nonprofit organizations and social enterprises throughout New York City spread the word of their good work through written communications, fundraising, and event planning. Originally from Colorado, April has a BFA in creative writing from Emerson College in Boston, and has been a working member of Brooklyn’s Park Slope Food Coop since 2006. As a volunteer, she has logged nearly 80 hours with New York Cares, designed and hosted a Jane’s Walk with the Municipal Art Society, and served on the board of the Brooklyn Queens Land Trust since 2018. Maria Abeja works as a member of Love and Learn childcare cooperative as a babysitter and loves working with kids! She also works cleaning houses. Edith Lopez, Love and Learn Cooperative. Teresa Martinez, Love and Learn Cooperative. Terry Rodriguez, The Kitchen Table CSA.